Aim: We aimed to evaluate the effect of a betalain-rich red beet concentrate (BRC) on joint discomfort and joint function. Methods: Individuals with self-reported knee discomfort were randomized and blinded to treatment with either oral BRC (50 mg twice a day) or placebo. Symptoms of discomfort and joint function were assessed using the Western Ontario and McMaster Universities Arthritis Index (WOMAC) and the McGill Pain Questionnaire (MPQ) before treatment and after 5 and 10 days of treatment. The general level of energy was evaluated using a visual analog scale (VAS) at the same time points. Results: In all, 40 individuals were evaluated in this study, 20 in the BRC group and 20 in the placebo group. The mean participant age was 55 years (range: 45–65). All participants completed the study. Individuals receiving BRC had a 27% better MPQ score after 10 days than did individuals in the placebo group (P=0.003). Furthermore, knee function, as measured by WOMAC score, was 26% better in the BRC group than in the placebo group (P<0.0013). Participants receiving BRC had a significantly better VAS score for energy after 5 (P=0.002) and 10 days (P=0.012) of treatment than did individuals receiving placebo. Conclusion: Short-term use of BRC in individuals with knee discomfort significantly improved knee discomfort and joint function, as measured by WOMAC and MPQ scores, and energy, as measured by a VAS. Betalain-rich concentrate (BRC) is a proprietary, patent-pending concentrate of beets that is standardized to contain a minimum content of 25% betalains and is substantially free of sugars and nitrates. Our previous pilot clinical study showed that short-term treatment with BRC improved joint function and discomfort of knee joints in individuals with knee distress.7 To confirm this primary observation, we performed a double blind, placebo-controlled clinical study of BRC, in individuals with knee discomfort. BRC and oat bran were provided by FutureCeuticals Inc (Momence, IL, USA). BRC was derived from red beet (Beta vulgaris L.), depleted of sugars, and concentrated to a total betalain content of at least 25%. The relative composition of BRC has been previously reported by Nemzer et al8 and the components are as follows: betanin (23.8%), isobetanin (30.3%), 17-decarboxy-betanin (3.6%), 17-decarboxy-isobetanin (4.7%), and neobetanin (16.8%). The relative measurement of the pigments is expressed as percentage of the total peak area. The WOMAC, is a multidimensional, self-administered health status instrument for patients with osteoarthritis of the hip or knee. The pain, stiffness, and physical function subscales fulfill conventional criteria for face, content and construct validity, reliability, responsiveness, and relative efficiency. WOMAC is a disease-specific purpose built high performance instrument for evaluative research in osteoarthritis clinical trials.9 The WOMAC consists of 24 items divided into three subscales assessing pain (with five items providing a total score ranging from 0 to 20), stiffness (with two items providing a total score ranging from 0 to 8), and functional limitations (with 17 items providing a total score ranging from 0 to 68). Together, the subscales give a total score ranging from 0 (best) to 96 (worst). The WOMAC index was administered on day 1 (pretreatment). Ten male and ten female subjects were distributed in each group, for a total of 20 subjects per group. The WOMAC was also administered after 5 and 10 days of treatment. The McGill Pain Questionnaire (MPQ) is a multidimensional pain questionnaire used to quantify the quality and intensity of pain.12,13 The questionnaire was designed to provide quantitative measures of clinical pain that can be treated statistically. On the first category, subjects have to select a word that “describes” the pain (like “flickering”, “pulsing”, “throbbing”). The second category includes the pain components (“fearful”, “frightful”, “terrifying”). The evaluation of the pain (from “no pain” to “excruciating”). The last part includes a miscellaneous description (“spreading”, “radiating”, “penetrating”, “piercing”). After completing the questionnaire, users will have selected seven words that best describe their pain. Each chosen word has an associated numerical value, giving a total score ranging from 0 (no pain) to 78 (severe pain). The MPQ was administered on day 1 (pretreatment) and after 5 and 10 days of treatment. A visual analog scale (VAS) is a widely used, subjective, unidimensional questionnaire. Energy and activity levels of the subjects were measured using a VAS on day 1 (pretreatment) and after 5 and 10 days of treatment.14–16 Subjects were instructed to mark on the line how they were feeling at the moment. The total line length was 100 mm. Left-most marks indicated the highest levels of the parameter (100), while right-most marks indicated the lowest levels (0). The distance of each mark was measured in millimeters from the right end of the line. The measurement for each parameter on days 5 and 10 was subtracted from the day 1 preingestion baseline measurement to give an indication of improvement. Statistical comparisons of the pre- and posttreatment time points, within and between groups were made using GraphPad® Prism® 6.01 (GraphPad Software Inc., La Jolla, CA, USA). A chi-square test was performed to determine whether the data sets had a normal distribution. Normally distributed data was analyzed using a paired two sample t-test. P-values less than 0.05 were considered statistically significant. Forty participants were selected after being prescreened using the WOMAC scores.9 The total WOMAC score on day zero (pretreatment) showed a mean (± standard deviation [SD]) of 67.8 (±8.8) for the group assigned to the placebo treatment and 62.5 (±5.31) for the group assigned to the BRC treatment. Both the BRC and the placebo groups consisted of 10 men and 10 women. The participants in the placebo group had a mean age of 52.27 (±6.2) years and a BMI of 26.49 kg/m2 (SD ±2.9); for the BRC-treated group, the mean age was 53.2 (±5.9) years and mean BMI was 27.2 kg/m2 (SD ±2.8). No significant differences were observed in the WOMAC score of the two groups before treatment (P=0.60) or in the WOMAC score of the two groups after 5 days of treatment. However, after 10 days of treatment, the BRC-treated group had significantly greater improvement (reduction) in the total WOMAC score (26%) than did the placebo group (11%) (P<0.013) (Figure 1). Figure 1 Total WOMAC score change over baseline at day 10 of treatment. Notes: The total WOMAC score did not show significant differences between the groups before treatment (P=0.60). The change over baseline or ratio was calculated based on the day 0. 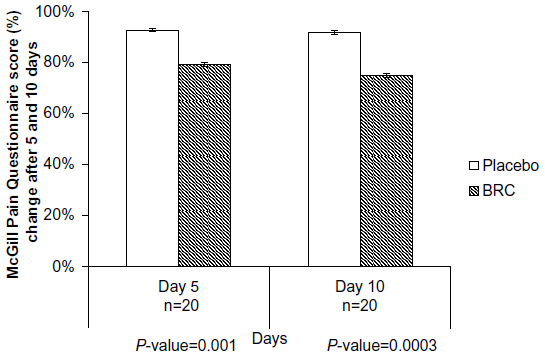 WOMAC score did not show a significant reduction of the score after 10 days (11% reduction) when compared with day 0. After 10 days of treatment, the BRC group showed a 26% significant reduction in the score (P<0.01). Values are presented as mean % ± standard error (n=20 in each group). Abbreviations: BRC, betalain-rich red beet concentrate; WOMAC, Western Ontario and McMaster Universities Arthritis Index. No differences were observed in the MPQ scores of the placebo and BRC groups prior to treatment (P=0.08). After 5 days of treatment, the MPQ score in the BRC-treated group was 23% better than that of the placebo group (P=0.019). The MPQ score of the BRC-treated group improved further and after 10 days, was 27% better than the placebo group (P=0.003) (Figure 2). We conducted post-hoc power analyses using G*Power version 3.1 (Heinrich-Heine-University, Düsseldorf, Germany)17–19 with sample size set at 20 per group, α=0.5, two-tailed. Power (1-β) achieved was at 0.99 for both comparisons, at day 5 and day 10. Figure 2 McGill Pain Questionnaire score after 5 and 10 days of treatment. Notes: Data collected on day 0 did not show significant differences between the groups (P=0.08). The McGill Pain Questionnaire score showed significant improvement in the BRC-treated group at day 5 (P=0.019) and day 10 (P=0.003). Values are presented as mean percent change over baseline ± standard error (n=20 per group). Abbreviation: BRC, betalain-rich red beet concentrate. The VAS energy scores of the two groups before treatment did not show any significant differences. The VAS energy scores of the BRC-treated group improved (from the baseline), by 19.6 mm on day 5 and by 13.9 mm on day 10 (Figure 3). In contrast, the VAS energy scores of the placebo group were worse, by 15.6 mm on day 5 and by 15.9 mm on day 10. Participants taking BRC had significantly higher VAS energy scores than did participants taking placebo after 5 (P=0.002) and 10 (P=0.012) days (Figure 3). There was no significant difference in the VAS energy scores on the BRC-treated group when day 5 and day 10 were compared. Figure 3 Average VAS energy score after 5 and 10 days of BRC or placebo treatment. Notes: Higher scores correspond to better subjective self-report on a 100-point scale. There was no difference between VAS scores prior to treatment between groups. 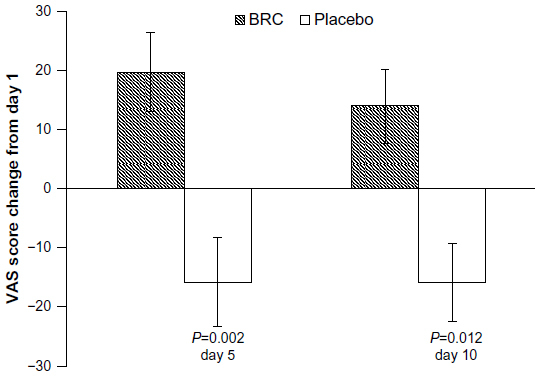 VAS energy scores were improved on the BRC group at day 5 (P=0.002) and day 10 (P=0.012) when compared to placebo. Values were determined with a metric scale, from 0 to 100. Values are presented as mean ± standard error (n=20 per group). Abbreviations: BRC, betalain-rich red beet concentrate; VAS, visual analog scale. BRC improved discomfort and joint function scores on three assessment instruments. 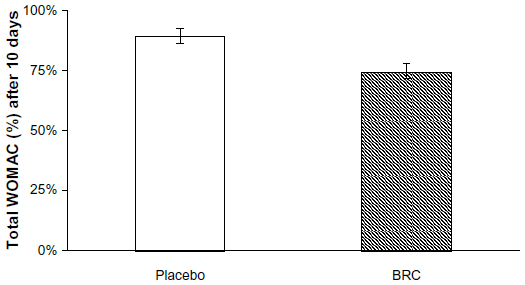 Short-term use of BRC was better than placebo in improving feelings of discomfort, energy level, and joint function. This finding is in agreement with and extends our previous report of the efficacy of BRC.20 We previously reported administering 35, 70, or 100 mg of BRC and demonstrated a dose-dependent effect. The 50 mg dosage used in this study resulted in improvement between that seen with 35 and 70 mg in our previous study. This dosage had sufficient potency to exert a beneficial effect over a relatively short treatment time, 5 to 10 days. Treatment with 50 mg of BRC twice a day for 10 days resulted in a 26% improvement in scores on the WOMAC, a reliable and well-recognized measure of joint function (Figure 1). BRC treatment also resulted in a significant reduction in the MPQ score, a reliable and well-recognized subjective measure of discomfort (Figure 2). In the current study, the MPQ scores showed a significant improvement of 23% after 5 days. This effect was extended even further to 27% after 10 days. Individuals taking BRC also had significantly higher VAS energy scores than did individuals taking placebo, after 5 and 10 days. Joint discomfort and stiffness are major inhibitors of function and activity.23,24 Current analgesic treatments are intended to reduce discomfort and inflammation. Ideally, reduced discomfort and inflammation lead to decreased stiffness and improved functional activity. Betalains have been reported to reduce myeloperoxidase activity and oxidation, two key components of the inflammatory process.4,6,25,26 Reduction in myeloperoxidase activity reduces the production of hypochlorous acid, a potent oxidant.5,27 Our group is currently investigating the role of betalains in reducing inflammation and improving joint discomfort and function. It is conceivable that a reduction of inflammation, caused by the betalains present in BRC, may have led to reduced feelings of knee joint discomfort and of improved functional activity. BRC is a promising new natural product for people with joint discomfort. The dose of 50 mg of BRC, twice a day, provided significant improvement in knee discomfort and function within 5 to 10 days, with no side effects. These results were associated with increased feelings of energy, which could be explained by the reduction of knee discomfort, and increased activity level. A larger clinical study is planned, to investigate the effect of long-term treatment with BRC on knee joint comfort, function, and performance. The present study was funded by FutureCeuticals, Inc. We express our gratitude to John Hunter and Brad Evers (FutureCeuticals, Inc.) for their comments and suggestions in the preparation of this article. We would like to thank Michael Sapko for his help in editing the manuscript. Applied BioClinical is the sister company of FutureCeuticals Inc., Reyes-Izquierdo T, Pietrzkowski Z, Shu C and Argumedo R are employees of Applied BioClinical. Nemzer B is the Director of Research and Development and quality assurance for FutureCeuticals Inc. Wybraniec S has previously collaborated with FutureCeuticals Inc. in the identification and characterization of betalains. The authors report no other conflicts of interest in this work. Steinbeck MJ, Nesti LJ, Sharkey PF, Parvizi J. Myeloperoxidase and chlorinated peptides in osteoarthritis: potential biomarkers of the disease. J Orthop Res. 2007;25(9):1128–1135. Katrantzis M, Baker MS, Handley CJ, Lowther DA. The oxidant hypochlorite (OCl-), a product of the myeloperoxidase system, degrades articular cartilage proteoglycan aggregate. Free Radic Biol Med. 1991;10(2):101–109. Bush TM, Shlotzhauer TL, Imai K. Nonsteroidal anti-inflammatory drugs. Proposed guidelines for monitoring toxicity. The Western journal of medicine. 1991;155(1):39–42. Allegra M, Tesoriere L, Livrea MA. Betanin inhibits the myeloperoxidase/nitrite-induced oxidation of human low-density lipoproteins. Free Radic Res. 2007;41(3):335–341. Zielinska-Przyjemska M, Olejnik A, Dobrowolska-Zachwieja A, Grajek W. In vitro effects of beetroot juice and chips on oxidative metabolism and apoptosis in neutrophils from obese individuals. Phytotherapy research: PTR. 2009;23(1):49–55. Gentile C, Tesoriere L, Allegra M, Livrea MA, D’Alessio P. Antioxidant betalains from cactus pear (Opuntia ficus-indica) inhibit endothelial ICAM-1 expression. Ann N Y Acad S. 2004;1028:481–486. Wybraniec S, Starzak K, Skopinska A, Nemzer B, Pietrzkowski Z, Michalowski T. Studies on nonenzymatic oxidation mechanisms in neobetanin, betanin, and decarboxylated betanins. J Agric Food Chem. 2013;61(26):6465–6476. Nemzer B, Pietrzkowski Z, Spórna A, Stalica P, Thresher W, Michałowski T, et al. Betalainic and nutritional profiles of pigment-enriched red beet root (Beta vulgaris L.) dried extracts. Food chemistry. 2011;127(1):42–53. Lee S, Inglett GE, Carriere CJ. Effect of Nutrim Oat Bran and Flaxseed on Rheological Properties of Cakes. Cereal Chemistry. 2004;81(5):637–642. Mohamed AA, Rayas-Duarte P, Xu J, Palmquist DE, Inglett G. Hard Red Winter Wheat/Nutrim-OB Alkaline Fresh Noodles: Processing and Texture Analysis. Journal of Food Science. 2005;70(1):S1–S7. Chalder T, Berelowitz G, Pawlikowska T, Watts L, Wessely S, Wright D, et al. Development of a fatigue scale. J Psychosom Res. 1993;37(2):147–153. Gift AG. Visual analogue scales: measurement of subjective phenomena. Nurs Res. 1989;38(5):286–268. Lee KA, Hicks G, Nino-Murcia G. Validity and reliability of a scale to assess fatigue. Psychiatry Res. 1991;36(3):291–298. Erdfelder E, Faul F. [A class of information integration models for the Oppel-Kundt illusion]. Z Psychol Z Angew Psychol. 1994;202(2):133–160. German. Pietrzkowski Z, Nemzer B, Michałowski T, Wybraniec S. Influence of betalain-rich extract on reduction of discomfort associated with osteoarthritis. 2010. Available from: http://www.betalainsources.com/Betalain_Study.pdf. Accessed February 18,2014. Creamer P, Lethbridge-Cejku M, Hochberg MC. Factors associated with functional impairment in symptomatic knee osteoarthritis. Rheumatology (Oxford). 2000;39(5):490–496. Sharma L, Cahue S, Song J, Hayes K, Pai YC, Dunlop D. Physical functioning over three years in knee osteoarthritis: role of psychosocial, local mechanical, and neuromuscular factors. Arthritis Rheum. 2003;48(12):3359–3370. Netzel M, Stintzing F, Quaas D, Strass G, Carle R, Bitsch R, et al. Renal excretion of antioxidative constituents from red beet in humans. Food Res Int. 2005;38(8):1051–1058. Stintzing FC, Herbach KM, Mosshammer MR, Carle R, Yi W, Sellappan S, et al. Color, betalain pattern, and antioxidant properties of cactus pear (Opuntia spp.) clones. J Agric Food Chem. 2005;53(2):442–451. Allegra M, Furtmuller PG, Jantschko W, Zederbauer M, Tesoriere L, Livrea MA, et al. Mechanism of interaction of betanin and indicaxanthin with human myeloperoxidase and hypochlorous acid. Biochem Biophys Res Commun. 2005;332(3):837–844.